Yes, Shrek Forever After starts out with fast paced 3D antics and doesn’t slow down until the credits are rolling. All of your favorite characters are back and the standout is Eddie Murphy as the sassy Donkey. He’s funny, quick-witted and his singing is hysterical. The song choices are spot-on and contribute to the entertainment value of the film in general. Shrek Forever After is the perfect family film to be enjoyed by all! One shouldn’t be concerned if you haven’t seen the three previous Shrek films, as this one explains everything you need to know about Shrek the ogre, the princess, their children, her parents and the kingdom. The theme centers on Shrek’s disenchantment with his current life. The enjoyable aspects are the enhancements of the characters’ personalities and the addition of several silly jokes. Mike Myers as the voice of Shrek starts out by giving us a glimpse of his new life. He’s married, has triplets but is not happy. Shrek is bored as every day is the same and he misses the excitement of scaring the townsfolk. He sulks and whines, “I used to be the scary ogre, now I’m the Jolly Green Joke!” The absence of fear and respect from the townsfolk are now his main gripe as his new life is, sadly, lackluster. These doldrums lead Shrek to make a pact with the evil Rumpelstiltskin, who grants him one day of his previous life in exchange for any day of his current life. Good ole evil ‘Rumple’ chooses the day that Shrek was born. Oh dear… Shrek doesn’t see this one coming and the consequences are disastrous. The story is similar to Frank Capra’s film, It’s a Wonderful Life (1946), as after the deal is signed, Shrek sees what happens as if he, in fact, never existed. The land Shrek knew as home has changed dramatically. Princess Fiona (Cameron Diaz) is now the leader of a resistance movement in which she has organized a renegade band of ogres. They train in the forest and are very serious in their quest to overthrow ‘Rumpel’ who has named himself King of the land. ‘Rumpel’s’ faithful servants are ugly witches who fly on broomsticks and create havoc. Using witches as the bad guys (girls) is perfect as young audience members immediately identify them as evil. Flying on broomsticks adds amazing opportunities for spectacular visual effects. The witches also fly straight into trees at times and their crashes trigger built in jokes. ‘Rumpel’ as the ‘really bad guy’ is also perfect; all children know him from the classic fairy tale. He’s got an attitude in this film that is very comical to view. He’s demanding and fun to watch as he wears different wigs depending upon the occasion. His ‘angry wig’ is bright red and stands straight up in the air similar to a troll doll. Kids in the screening were laughing out loud whenever he placed a new gigantic wig on his little squatty body. These scenes reminded me of Tim Burton’s Alice in Wonderland (2010), as the Queen of Hearts’ big head and demanding antics were, in fact comical. One must remember the main audience here is children and that the ‘bad guy’ needn’t be scary. A well-deserved pat on the back is in order for screenwriters Josh Klausner and Darren Lemke as well as director Mike Mitchell. Shrek’s new world is a foreign one, although he never loses sight of his goal; a loving kiss between he and Fiona. This kiss will break the spell, returning all to normalcy. New comical capers in Shrek Forever After include a novel, overweight look for Puss. Wow, this fat cat has been living the life, the trademark boots don’t even fit. The lazy, apathetic viewpoint is perfect for a host of jokes. Chef-Cookie and his chimichanga stand idea is random and very funny. Kids were howling at the suggestion that one is certainly needed after the battle, due to fatigue and the simple hunger factor. The weird kid that whines to his dad and constantly says to Shrek, “Do the roar” reminded me of characters from the Wizard of Oz (1939). The three singing boys of the lollipop gang as the voices and faces are similar. The addition of the Pied Piper with an upgraded flute is also fitting. 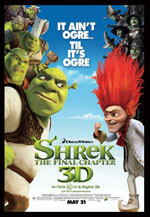 Bottom-line: Shrek Forever After is humorous, off-beat and just silly enough for all to have an enjoyable time. Let’s also not forget all those singsong melodies that enhance the story line!